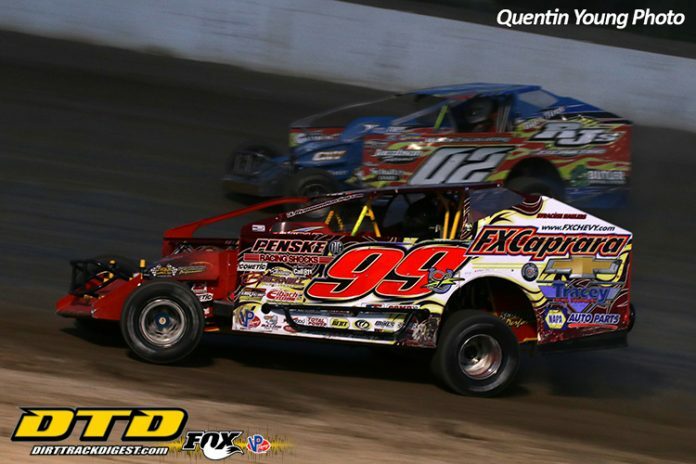 FULTON, NY – Larry Wight had a good evening at Fulton Speedway, claiming wins in both the 358-Modifieds and the Empire Super Sprints. On top of that, Wight claimed the 2018 Modified track championship. The Empire Super Sprints put on a show for the ages in their second event of the weekend, with Billy VanInwegen taking command at the drop of the green. VanInwegen held onto a narrow lead the first ten laps, as the wild brawl for second included Steve Poirier, Jonathan Preston, Jason Barney, and Danny Varin. The red flag flew for Dan Douville flipping on lap 11, halting the five car scram for the lead. When racing resumed, VanInwegen went back to the lead, but the fight was just heating up. Varin reached second on lap 15, sliding around Poirier for the spot. VanInwegen was not far ahead, and Varin kept the gap within a car length. Behind them, Larry Wight had climbed from 19th into the top five after a blown motor in the heat forced him to the B-Main. With five to go, the top five were nose to tail, with VanInwegen leading Varin, Preston, Wight, and Poirier. A slider soon after sent Wight to third, and lapped traffic was looming. VanInwegen needed to get off his line on the bottom of turn three to negotiate traffic, allowing Varin and Wight to reach his back bumper. The trio went three wide for the lead with two to go, but VanInwegen hung tough. Coming to the white flag, Wight got a nose under VanInwegen and pried him off the bottom, but neither Varin or VanInwegen were done. Exiting turn four, Varin had a run up top of Wight, and VanInwegen pulled low. In a three wide finish for the win, it was Larry Wight edging out Billy VanInwegen and Danny Varin. Steve Poirier finished fourth, still just a few carlengths behind Wight, while Jason Barney grabbed fifth. Joe Shields and Glenn Forward dueled it out early in the 35-lap Modified main, with Forward finally securing the top spot from Shields by lap eight. Rob Bellinger jumped past Shields and into second soon after, and Bellinger quickly went to work on Forward. For a number of laps, Bellinger could only get as far as Forward’s door, skating around the middle as Forward worked the bottom. On lap 19, Forward bobbled ever so slightly, and Bellinger jumped to the lead. Just behind Bellinger and Forward, Larry Wight had clawed from twelfth up to third. Entering the season points finale, Wight had a slim lead of just a couple points over both Tim Sears Jr. and rookie Ronnie Davis III, but by lap 20, Wight had distanced himself from both challengers. Wight used the same line in the Modified as he did in the Sprint Car earlier on, blasting the cushion in turns one and two, then the bottom in three and four. Wight got by Forward for second on lap 21, then drove around Bellinger for the lead the next time by. Once out front, Wight turned on the afterburners. Over the final ten laps, Larry Wight extended his lead to a full straight over Bellinger, cruising away to his third win of the year and the track championship with it. Rob Bellinger chased in second, followed by Jordan McCreadie, Tom Sears Jr., and Tim Sears Jr.
Jason Parkhurst decimated the Late Model field, taking the checkered nearly eight seconds ahead of runner up Sean Beardsley. Jake Davis seemed on his way to another Novice Sportsman win, but a broken driveshaft sent him to the infield and handed the win to Quinn Wallis. While many of the frontrunners in the first Sportsman main fought for the bottom, Wade Christman went around the top of them all en route to his second win of the season. Mike Phelps got by Joe Sobotka on lap 18 of the second main, but had to hold off a strong push by Zach Sobotka in the final laps to hang on for his second checkered of the year. 2018 Fulton Speedway Track Champions – Larry Wight (Modified) Alan Fink (Sportsman) Jason Parkhurst (Late Models). (Tracey Road Equipment DIRTcar Modifieds 35 Laps) – LARRY WIGHT, Rob Bellinger, Jordan McCreadie, Tom Sears Jr., Tim Sears Jr., Glenn Forward, Pat Ward, Bobby Herrington, Billy Whittaker, Ron Davis III, Jeff McGinnis, Roy Bresnahan, Joe Shields, Nick Krause, Roy Shields, Andy Noto, Brent Cross, Larry Welling, DJ Forbes. (2018 Tracey Road Equipment DIRTcar Modifieds Track Champion) – Larry Wight. (SUNY Canton DIRTcar Sportsman #1 – 25 Laps *Pending Motor Tech*) – WADE CHRISMAN, Jim Spano, Corey Barker, Willy Decker Jr., Brandon Carvey, Matt Janczuk, Tim Abate, Jessica Power, Mark Yorker, Brett Draper, Alan Fink, AJ Miller, Rick Miller, Mike Fowler, Ricky Yelle, Chuck Miller, Robert Gage, Anthony Rasmussen, Billy Savue, Dave Talbot, John Traphagen, Richie Riggs, Jeff Taylor, Tyler Murray, DNS – Matt Fink. (SUNY Canton DIRTcar Sportsman # 2 – 25 Laps *Pending MotorTech*) – MIKE PHELPS, Zach Sobotka, Bob Henry, Amy Holland, Jackson Gill, Joe Sobotka, Kyle Perry, Chris Hulsizer, Tyler Corcoran, Josh Reome, Jimmy Moyer, Charlie Tibbitts, Josh Livingston, Earl Rudy, Rick Rogala, Jake Petit, Matt Becker, Joe Kline, Tony Komuda, George Dyer, Dorian Wahdan, Chris Mackey, Greg Doust, Shawn Shaw, Rich Townsend. (Billy Whittaker Cars & Trux RUSH Late Models 20 Laps) – JASON PARKHURST, Sean Beardsley, Max Hill, Dale Caswell, Bret Belden, Kevan Cook, Chris Fleming, Tim Sears Jr., Matt Kitts, Tony Finch II, Billy Eisele. (E&V Energy Novice Sportsman 15 Laps) – QUINN WALLIS, Richard Murtaugh, Ryan Gustin, Pat Nolan, Riley Rogala, Kyle Rood, Kearra Backus, Jake Davis, DNS – Brandon Chretian. (Lucas Oil Empire Super Sprints 25 Laps) – LARRY WIGHT., Billy VanInwegen, Danny Varin, Steve Poirier, Jason Barney, Jonathan Preston, Kelly Hebing, Shawn Donath, Brent Wright, Coleman Gulick, Chad Miller, Jeff Cook, Tommy Wickham, Jeff Trombley, Matt Tanner, Paul Kinney, Scott Holcomb, Dave Axton, Ryan Harrison, Josh Azzi, Keith Granholm, Josh Flint, Matt Billings, Cory Sparks, Dan Douville, Tyler Graves.